Martine Syms, Incense Sweaters & Ice, 2017, HD video, color, sound, 70 minutes. 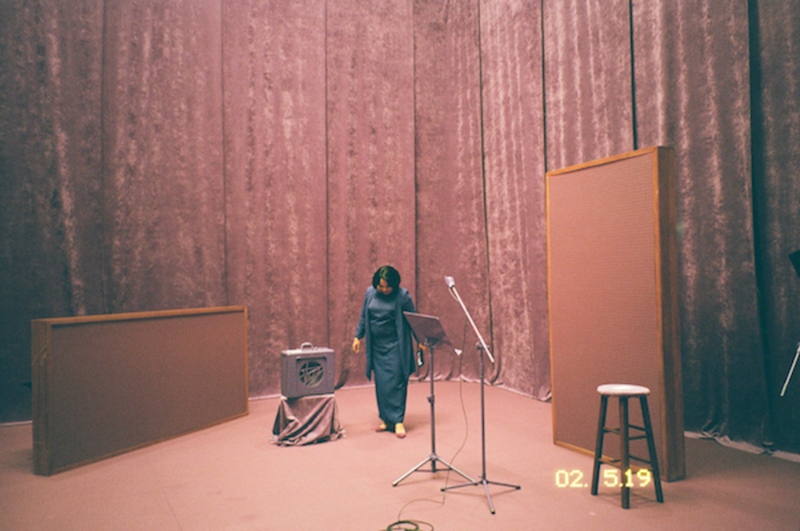 Martine Syms is a self-described “conceptual entrepreneur” based in Los Angeles. Her artistic practice spans publishing, performance, sculpture, photography, film, and more. Here Syms discusses the politics of migration, surveillance, and presentation as they appear in “Projects 106: Martine Syms,” her first solo museum exhibition in the US, which is organized by Jocelyn Miller and on view at the Museum of Modern Art in New York from May 27 through July 16, 2017. THE CENTERPIECE OF THIS SHOW is my first feature-length film, Incense Sweaters & Ice. The title refers to goods that were originally manufactured in Altadena, a neighborhood in northeast Los Angeles, which is where I’m from and also where one of the main characters, Girl, is from. She is a traveling nurse, and is basically making a reverse migration from the one that older women in her family madeshe’s going from Los Angeles to Saint Louis to Clarksdale, Mississippito do a contract job, while voices narrate their own migrations in the other direction. The idea of the Great Migration and its psychogeographies is of considerable interest to me. For a lot of blacks, that migration, which often involved their families’ migration into cities, changed the way that they presented and fashioned themselves. Two books have really informed my thinking: One is Migrating to the Movies: Cinema and Black Urban Modernity by Jacqueline Stewart, in which she unpacks the parallel between the migration of blacks from the rural South to the urban North and their migration into the film industry, both behind and in front of the camera. They have similar time lines, which is roughly 1915 to 1970; by 1970 you start to see more of a black presence. The other is Isabel Wilkerson’s The Warmth of Other Suns: The Epic Story of America’s Great Migration, which pairs narratives of individual migrations with contemporaneous developments in photography and motion pictures. I’m interested in how that’s continued to happen, how your sense of self and the way you present yourself are forms of performance, and how this is tied to a knowledge of being seen or unseen. Excerpts from an interview with Martine Syms. For me, it’s hard to consider the imaging of black people outside of film’s ethnographic roots and its relationship to surveillance and cataloguing. Some of the earliest images of people of color were used for those purposes, and I see a lot of similarities between these earlier cinematic forms and present-day Web contexts, for instance. What if you were to assume that you’re being constantly recorded, which in our contemporary moment of widespread surveillance is more or less true? You could say that there’s just a giant film production happening at all times. What happens to you and your being or identity within that reality? How are we performing or acting in this context? There’s a link between the production of self or one’s identity and the mediated production of images, and I’m trying to tie them together both formally and conceptually. A primary reference for me is this idea I’ve been calling “ambient cinema”: ambient in the sense of expanded and environmental, that it’s always happening. I wanted the exhibition to look like a set and to have elements from a film production. The space is monochromatic to hint at or conjure this, and there is a large wall painting with the word girl spelled different ways to convey inflection. There’s also a suite of twelve photographs printed on film posters targeted toward African American audiences, creating a double exposure of seeing the original poster as well as the image. And there is an augmented-reality iOS app [WYD RN] built in collaboration with Brent David Freaney and designed specifically for the exhibition, which, when held over these images, triggers another interactive video that uses facial-recognition technology to play audio and video through the app. I’m interested in using augmented reality to further connect the project to digital realms and bring this kind of simultaneity into the exhibition space itself. My insistence on making my exhibition spaces also resemble sites of production is connected to two things: First is the idea that I don’t really think of things as ever being done, and so visually, I want it to be a space where something happens. Second, it connects to this idea of everyone’s ability to record everything, so the exhibition is already a space of production. People are going to be taking pictures and recording videos in there, and through the iOS app itself they can also produce images. What does this feedback loop do to the viewing experience? People are making images at the same time that they’re viewing them and feeling ambivalent about being in them; I’m invested in containing that ambivalence within the project itself and in my own imagemaking.